Tesla Motors was the first automaker to sell a production electric vehicle based on lithium ion batteries, the Tesla Roadster. Current Roadster owners as well as other prospective electric vehicle owners are interested to know how these batteries will hold up over time and miles. It's still pretty early in the game. Tesla Motors tells us that we should expect to have our battery packs holding 70% of their original capacity after 5 years or 100,000 miles. The oldest Roadsters are a bit over three years old and some vehicles are getting up into the 30,000+ mile range. How are the battery packs holding up so far? I've collected data from 20 owners in the Pacific Northwest to get an approximate idea of our batteries are performing. Before we dive into the results, I should explain a bit about how battery capacity is instrumented on the Roadster. The Roadster has two primary charging modes. Standard mode charges up to about 90% of the pack's capacity and holds the bottom 10% of the capacity in reserve. Range mode fully charges the battery pack and shows the full range available, including the bottom 10%. The range is shown in two ways, "Ideal Range" and "Estimated Range." Estimated range states the range based on recent driving history and so can't be compared across vehicles. Ideal range shows how many miles you can drive in the current mode if driving with the same mixed city/highway average energy use that gave the Roadster its EPA -rated 245 mile single charge range. The corresponds, for example, to driving 55 to 60 mph on level freeway in moderate weather. First, let's see how miles driven affects battery capacity. 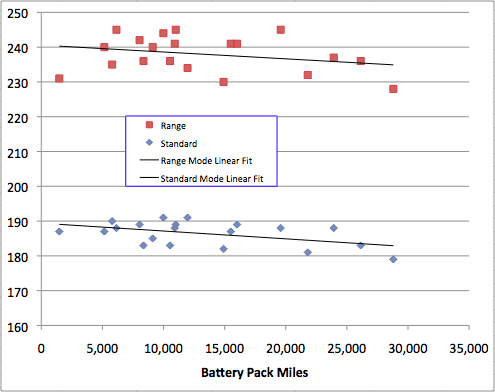 The red squares at the top of the graph show the range mode capacity expressed in ideal range miles (aka ideal miles) versus miles driven on each battery pack. The blue diamonds show the standard mode range. The straight lines show the tread for each set of readings. I interpret this graph to show that for this set of vehicles, individual variation between cars is larger than the pack degradation over approximately 30,000 miles. For range mode, the variation between cars is as much as 15 ideal miles between cars with comparable mileage, while the linear trend shows a drop of only 5 ideal miles across 30,000 miles of driving. For standard mode, the variation between cars of comparable mileage is under 10 ideal miles while the trend line shows a drop of perhaps 6 ideal miles. 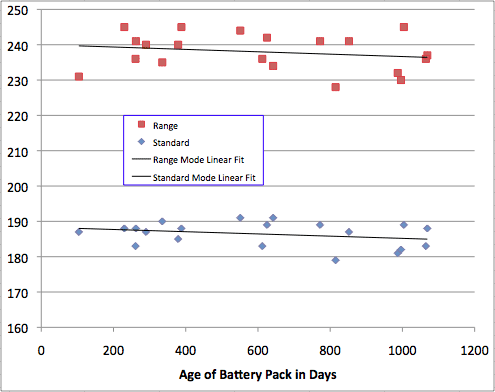 Lithium ion batteries lose capacity over time even if you don't use them. The graph shows the same vehicles over time instead of miles. Again, we see the same apparent patterns: variation between vehicles is larger than the average range lost over three years and variation in range mode is larger than the variation standard mode. While this is enough data to see some patterns emerge, it's a small fraction (about 1%) of the total Roadsters on the road. I'd like to collect more data to confirm these trends and also separate the effects of time and miles. Most of the Roadsters in this set are in the relatively mild coastal climate of Oregon, Washington and British Columbia. It would be interesting to analyze data from Roadsters in more extreme climates. This page contains a single entry by Tom Saxton published on December 19, 2011 9:19 PM. Steve Jobs - 30 Years of Life-Changing Influence was the previous entry in this blog. Watt Fun: Driving a Nissan Leaf is the next entry in this blog.